The other day I bought a pedometer to get ready for my October challenge, The Power of Ten. I wanted something pretty basic ... it didn't need to have amazing functions - as long as it counted my steps, it was fine. I ended up getting a New Balance one from Target for $6.99. They also had fancier ones that counted calories and monitored heart rate, but for what I needed it for, the one I got was fine. I tested it for the first time on Sunday, and I logged an even 11,000 for the day. It was a fairly busy day - I went to work and walked ten floors, went to Chinatown to look for something for my brother, got off the bus a few stops early and walked home, walked to the grocery store and back, and I did the Wii Fit for over an hour. Then I tested it again yesterday, to see how I would do on a "regular" day, and I was just shy of 8,000. I went to work and worked all day (mostly a desk job unfortunately), walked twelve floors, got off the bus a few stops early and walked home, went for my usual after work walk, then did the Wii Fit for about half an hour. I usually do at least an hour on the Wii Fit, but I was exceptionally tired for some reason (probably the heat - for some ridiculous reason, it was in the 80s yesterday! ), so I did as much as I could, then showered and got to bed by 8:30. I need to make sure I am at or above 10,000 steps every single day in October. When I was in college and trying to do 10k a Day, I would easily get 17-18,000 steps a day when I would go to the gym in the afternoons. This afternoon I am going to go and sign up for the school gym, which will hopefully help get my numbers up. I know it won't affect my pedometer, but I'm really looking forward to swimming laps at the pool. I love swimming - when I was at my parents' house this summer, I spent at least six hours in the pool every day. It was amazing. I'm dying to get back into the water! That's amazing!! I definitely don't get that many steps in! That's awesome that you get off the bus early, that's a great way to get some extra exercise in! Amy - I'm usually in bed by 11, 11:30 ... I was just really tired yesterday for some reason! Every now and then, I give in to the tiredness and go to bed super early, and it feels amazing and I wake up so refreshed! I am really excited about your Power of Ten challenge! 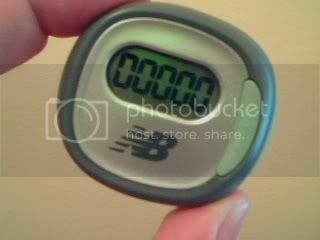 I have an old pedometer, but I think I will invest in a new one. It is hot here, too! Yesterday we tipped the thermometer at 100 degrees! UGH! That is not September weather!